Plastic Extruders Ltd, or Plastex, is a UK manufacturer of vinyl matting & flooring since 1962. With a manufacturing subsidiary in Alabama, USA, supported by 24-hour manufacturing and worldwide sales distribution, Plastex is at the forefront of the matting and flooring industry. The company remains committed to the development and manufacture of leading edge products that meet legislative, safety and high performance criteria. Their matting range includes over 40 distinctive products with differing performance characteristics to meet the various demands of diverse applications. Amongst these technically advanced products are light to heavy duty mattings with superior soil removal and liquid drainage, the highest rated slip resistant and anti-fatigue products, together with barefoot and wet area matting solutions. Plastex vinyl matting & flooring is designed to deliver results, whatever your specific need. 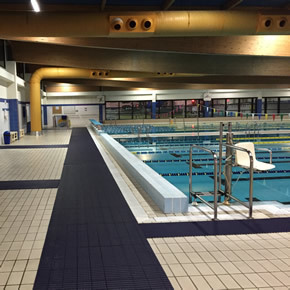 Slip-resistant Heronrib matting has been arranged around several pools at Santander’s Marisma Wellness Centre. 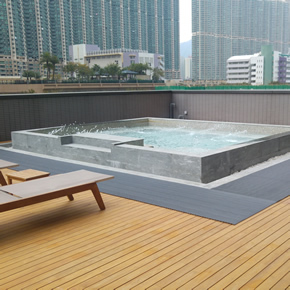 Heronrib matting has been laid in several areas of ‘The Visionary’, a new leisure development which has been built in Hong Kong.